The Journey of a Geek: Nintendo DS vs. PSP: Who Would Win? Nintendo DS vs. PSP: Who Would Win? Hello, geeks and nerds and some of my friends who are none of the above. :) Welcome to another slapped toegether blog entry, I all hope you enjoy my random ranting and or raving.. because there is no inbetween here. So today, as I was quickly trying to think of a topic (I'm not a very creative person), I decided to talk about my two best buds in the world! My Nintendo DS and PSP! ....... I know, I know. I have no life. So then I started thinking, if I pit the two together, who would stand triumphant? Who would claim the video game medal for Kaleb's Favorite Hand-held Video-game Device! What would make this more exciting you might ask? Putting it in a reality show format, of course. I'm a genius! 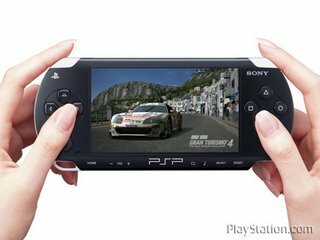 The PSP, one of man's best friends! You know, besides a Nintendo DS (they're both good). *drums play in background as Jeff Probst appears in my room* Welcome back to Survivor.... The PSP/DS Edition. To my right we have the PSP, which features such fantastic games as "Tekken: Dark Ressurection", "Daxter", and "Ultimate Ghosts and Goblins." You know on second though, forget about "Ultimate Ghosts and Goblins", he doesn't count. And to the left of me with have Nintendo's little system that could, The DS! What it lacks in power, it makes up for in personality. 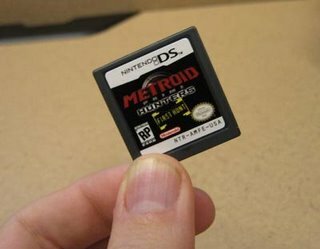 Using a new gameplay gimmick *cough*, I mean.. revolution.. the Nintendo DS uses a touch-pad for much of it's gameplay concepts. Luckily, the number of notable games is far greater then the PSP library, but some may note that many of the games don't have as much lasting appeal. Anyways, let's get on with it. *drums contine to roll as Tribal Council begins* Alright, why don't you two sit down. *DS and PSP sit down on there little benches* Now we're going to make our final decision here and now, this is.. the final tribal council! *dramatic music* We'll now bring in the only member of our jury, Kaleb, voted out at last week's tribal council. Don't ask me how Jeff Probst managed to get into this blog.. it just kinda happened. He was desperate for work, and I just couldn't turn him down. 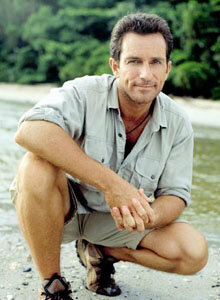 He's Jeff Probst! Kaleb and his Rant: "PSP you have lied to me! You know, besides the good times we've had with Daxter and Tekken: Dark Ressurection and... never mind, you really never lied to me. But, you're lack of an expansive game library means.. that I have to let you go. PSP *dramatic music* you're fired!" Jeff Probst: "Ouch! Oh no he didn't! ....... So I guess that's the end of the show, tune in next time for another exciting and possibly completely pointless entry in The Journey of the Geek. Until next time, May The Geek Be With You!" Did I mention how tiny the cartidiges are?! I mean.. dang. I sure hope the dog doesn't eat em. *sigh* That would mean bye bye Metriod. youve played Daxter huh? im INSANELY jealous. like INSANELY. you do not even know. anyways, love you kaleb. good job and keep checking my blog out!! !